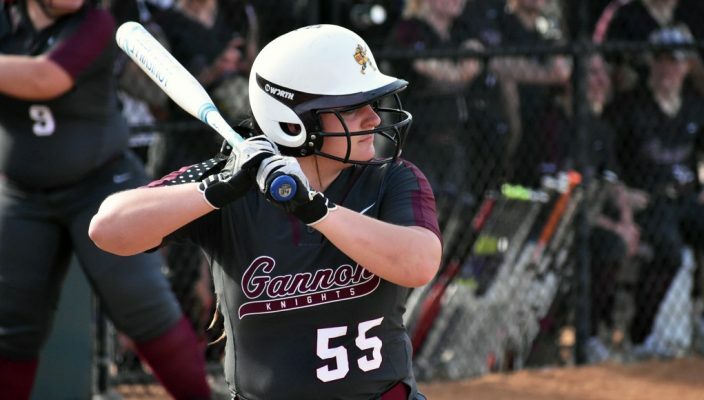 The Gannon University softball team had an historic season last year and the Knights are looking to top it this season. Gannon won the 2018 Pennsylvania State Athletic Conference Western Division title and the PSAC Championship, and advanced to the NCAA Division II Sweet 16 for the first time in program history under former coach Tom Jakubowski, who was in his last year at the helm. The team shattered its 12-year-old home run record by belting 48 home runs during the season and set a new slugging percentage record of .478. Kaity Stocker, named PSAC West freshman of the year last year, tied the single-season home run record with 12, set by Joanna Fergus in 2006. How does a team top a performance like that? This is what new coach Michelle Wiley is trying to figure out for this season. Wiley is no stranger to coaching, serving as the pitching coach for the last seven seasons. She hopes that this year’s team can excel as it did last year. Madi Beining, a junior who was named PSAC West pitcher of the year in 2018 after going 15-7 with a 2.37 ERA and five shutouts, thinks that Wiley can take the team to the championship. “With coach Wiley as our new head coach, I believe she brings some new talents and perspectives to the table, as she played college softball herself,” she said. “She knows what it takes to win a championship and she is doing a great job of leading us in that direction. The team brings back 10 starting position players and three starting pitchers from last year’s team, which was picked to finish first in the PSAC West in a preseason coaches poll. So far, the Knights have shown that they have what it takes to make it to postseason play again. Their current record is 11-6, following Tuesday’s nonconference doubleheader sweep of Notre Dame College of Ohio, 3-0 and 8-4 at McConnell Family Stadium. The Knights take an unbeaten 4-0 mark on the road going into Thursday’s 2:30 p.m. doubleheader at rival Mercyhurst — the PSAC opener for both teams. The team will then follow that up by traveling to Slippery Rock Saturday for a 1 p.m. doubleheader. Gannon also is on an eight-game win streak. Junior shortstop Sarah Ingerick would agree that the team is on the right track. “We are hitting better now than at this same point in years past, which was one of our goals,” she said. Senior pitcher and outfielder Kellyn Perich believes that all of the team’s new assets will help the team be better than ever. “We have picked up three incredible freshmen, a new passionate coach and a completely different lifting and agility program,” she said. “I believe these things will only aid us in achieving what this entire team has set out to accomplish. Beining tossed a complete-game four-hit shutout in Tuesday’s first game while Taylor Wilp, Autumn Smith and Megan Dietrick each had RBI hits. In the nightcap, Maria Taliani had three hits and two RBIs, and Rachel Tanilli and Wilp each drove in two runs to lead the offense.